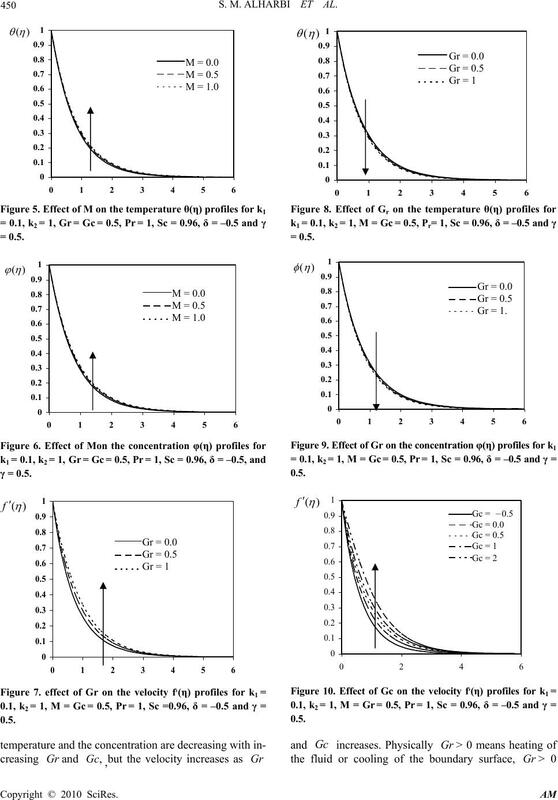 parameter and chemical reaction parameter on the flow, heat and mass transfer characteristics. with the distance from a fixed point studied by Crane . in Makkah, Makkah, Saudi Arabia. 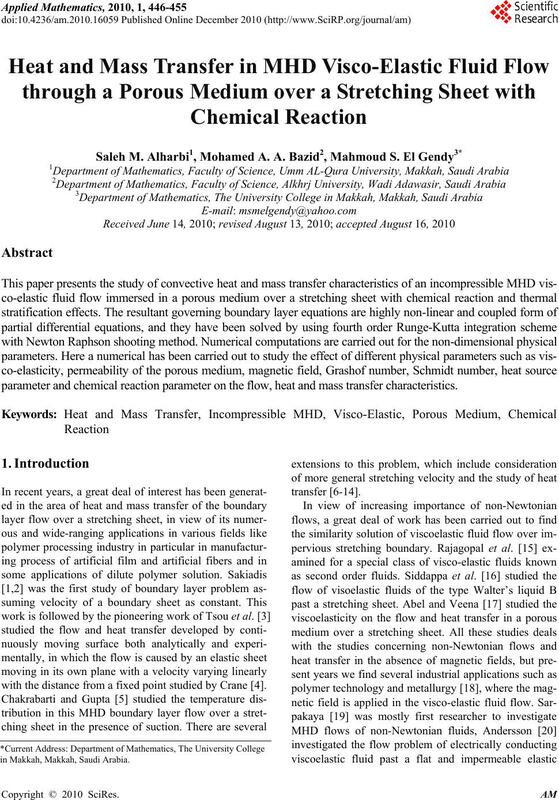 S. M. ALHARBI ET AL. teristics can be easily seen in a lot of industrial processes. 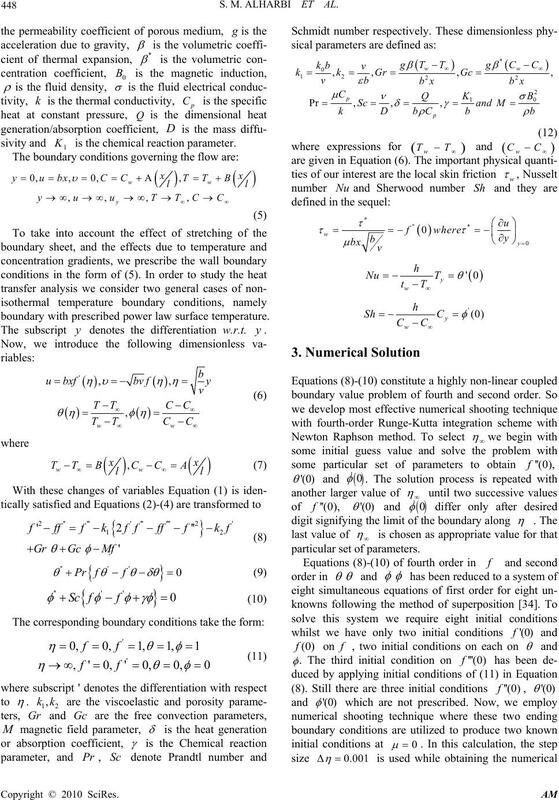 form of highly non-linear partial differential equations. is the chemical reaction parameter. 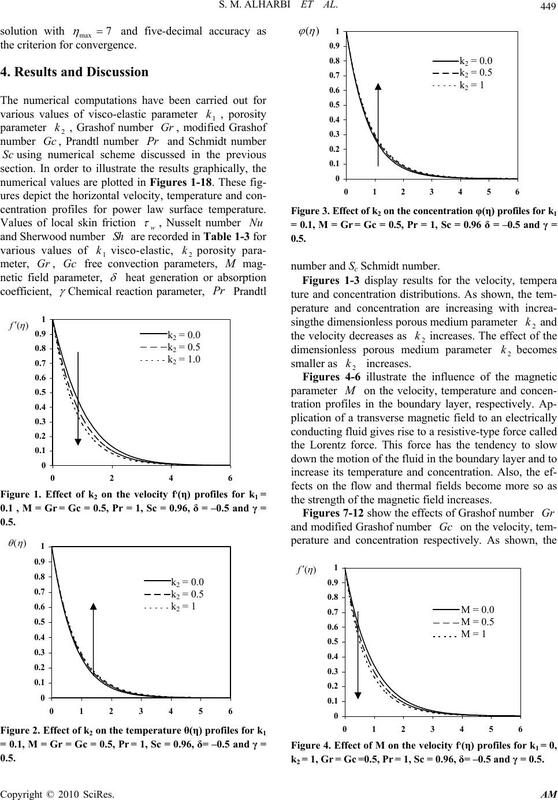 boundary with prescribed power law surface temperature. The subscript y denotes the differentiation w.r.t. 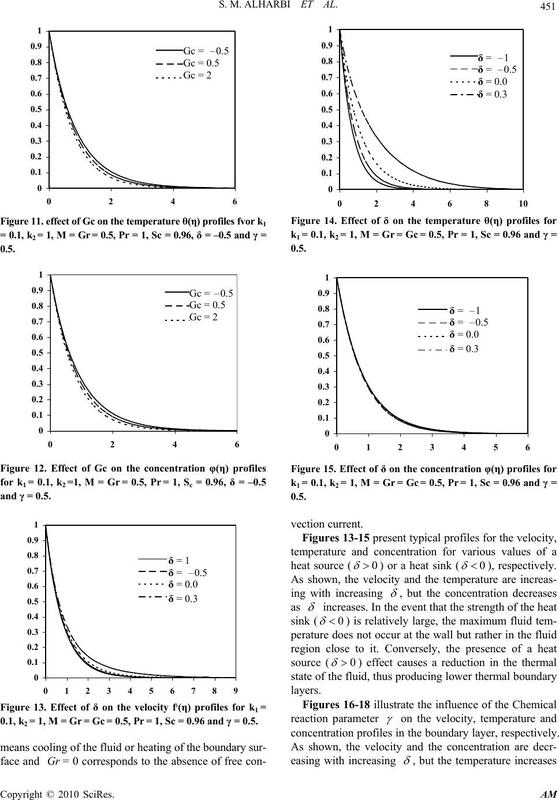 y.
centration profiles for power law surface temperature. number and Sc Schmidt number. the strength of the magnetic field increases. k2 = 1, Gr = Gc =0.5, Pr = 1, Sc = 0.96, δ= –0.5 and γ = 0.5. 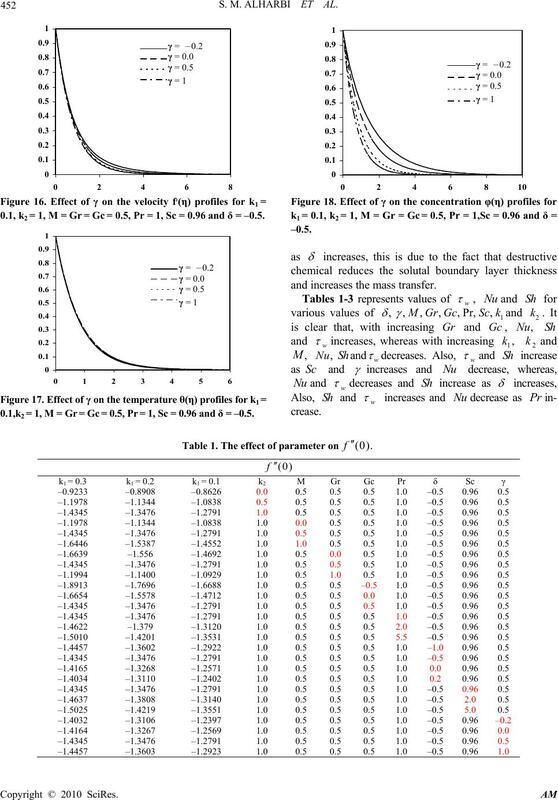 0.1, k2 = 1, M = Gr = Gc = 0.5, Pr = 1, Sc = 0.96 and γ = 0.5.
concentration profiles in the boundary layer, respectively. 0.1, k2 = 1, M = Gr = Gc = 0.5, Pr = 1, Sc = 0.96 and δ = –0.5. 0.1,k2 = 1, M = Gr = Gc = 0.5, Pr = 1, Sc = 0.96 and δ = –0.5. and increases the mass transfer. Table 2. 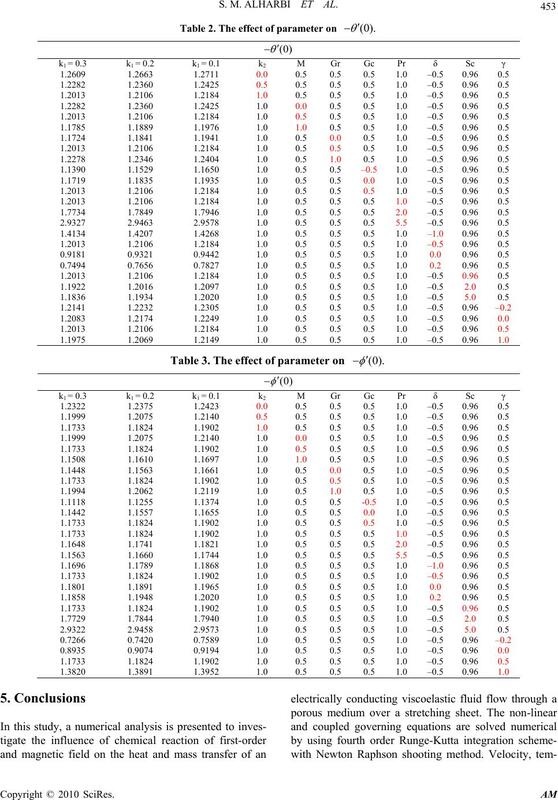 The effect of parameter on (0). Table 3. The effect of parameter on (0). Vol. 7, No. 1, March 1961, pp. 26-28. 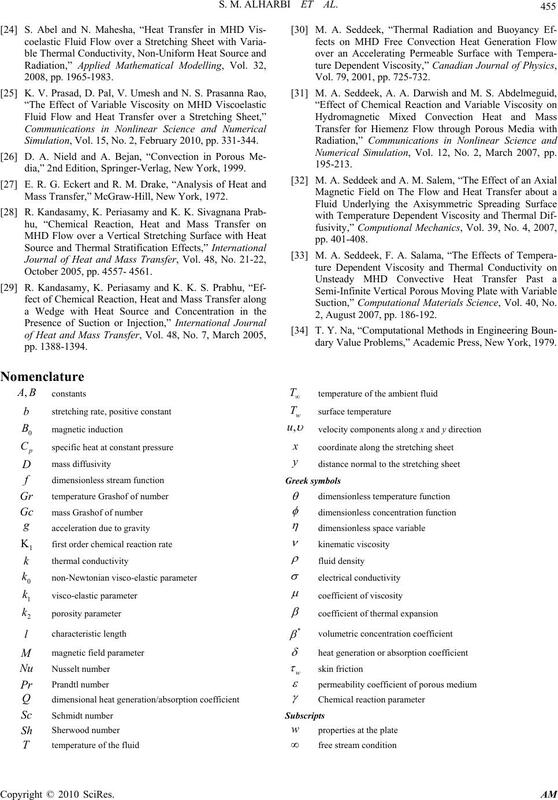 Surface,” AICHE Journal, Vol. 7, 1961, pp. 221-225. Mass Transfer, Vol. 10, 1967, pp. 219-223. No. 4, 1970, pp. 645-647. Journal of Mathematical Analysis and Applications, Vol. 135, No. 2, November 1988, pp. 568-580.
fer, Vol. 23, No. 2, March-April 1996, pp. 239-248. Vol. 62, No. 4, 2000, pp. 321-325. Mechanics, Vol. 38, 2003, pp. 513-520.
tional Communications in Heat and Mass Transfer, Vol. Letters A, Vol. 348, No. 3-6, January 2006, pp. 172-179. Vol. 23, 1984, pp. 213-215.
und Physik (ZAMP), Vol. 36, 1985, pp. 890-892. Vol. 33, 1998, pp. 531-540.
netic Field,” AICHE Journal, Vol. 7, 1961, pp. 324-328. 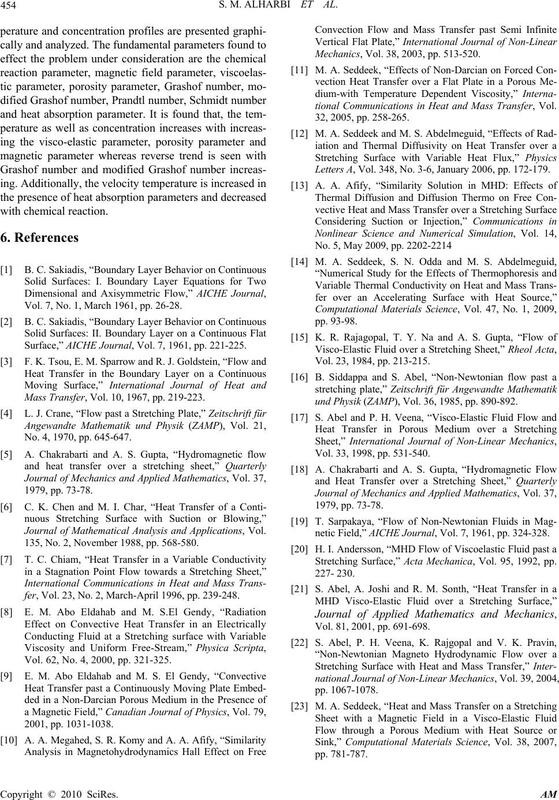 Stretching Surface,” Acta Mechanica, Vol. 95, 1992, pp. Vol. 81, 2001, pp. 691-698. Simulation, Vol. 15, No. 2, February 2010, pp. 331-344.
dia,” 2nd Edition, Springer-Verlag, New York, 1999. Mass Transfer,” McGraw-Hill, New York, 1972. October 2005, pp. 4557- 4561. Vol. 79, 2001, pp. 725-732. Numerical Simulation, Vol. 12, No. 2, March 2007, pp. 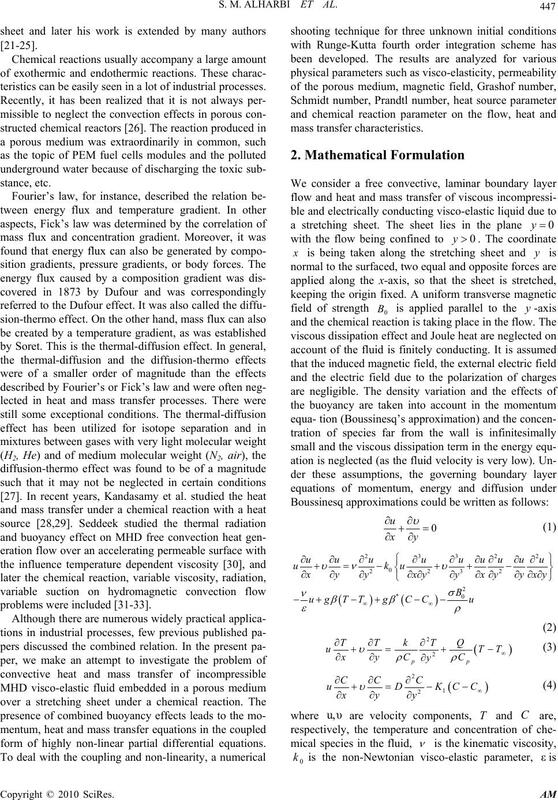 Suction,” Computational Materials Science, Vol. 40, No. 2, August 2007, pp. 186-192.
dary Value Problems,” Academic Press, New York, 1979.